This VPN provides fast connections, but its recent change in ownership raises issues with your data. First, let’s address the spooky stuff that pertains to paranoid types, journalists, and political activists. CyberGhost’s offices are located in Bucharest, Romania, a country not known for sharing online information with western intelligence concerns or law enforcement agencies. Don’t feel too cozy about it, though: The company was recently sold to Crossrider, which is based on The Isle of Man—a British Crown Dependency. England is a member of the Five Eyes (FVEY) data intelligence sharing program. If you consider using CyberGhost, be aware any sensitive information you send or receive could fall under direct government scrutiny. On top of that, Crossrider is a digital product company, and one of the products that it offers is ad server software for targeting mobile hardware. CyberGhost’s founder swears that user privacy will be maintained, despite the company’s sale to Crossrider. This pledge is backed up by the VPN’s strict no-logging policy. 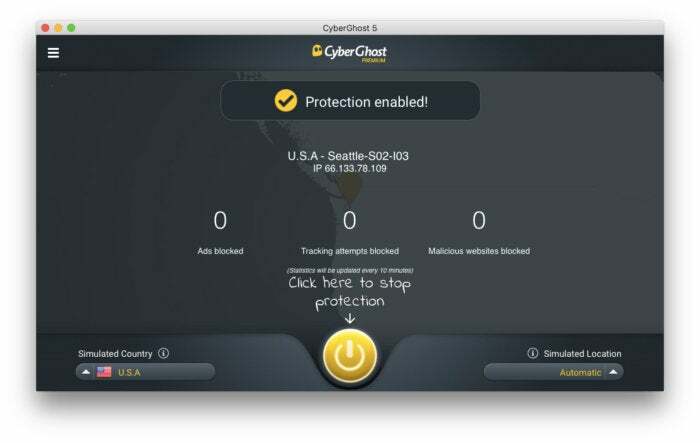 While other VPN providers retain data about where and when you connected to their servers, and how much data you transferred before disconnecting (purportedly for server diagnostic purposes), CyberGhost holds on to no user information to speak of—or so they say. Allegations made in a number of security forums say that the company’s no-logging policy isn’t worth the display it scrolls across. Whether this policy is upheld by the company’s new owners, who purchased the VPN service in 2017, remains to be seen. However, if you’re just looking for a VPN to protect your personal information while you use an unprotected public wi-fi network, you don’t really need to worry about any of this. CyberGhost uses AES-256-bit encryption to keep their customers’ data and browsing habits secure from prying eyes. This same level of encryption offered by most other VPN service providers and is currently used by military and government agencies around the world to relay sensitive data. CyberGhost’s macOS app is pretty to look at, but slow to load. On a 2015 13-inch Retina MacBook Pro that I used for testing, it took between five and ten seconds before the app’s UI finally presented itself. Once loaded, though, using CyberGhost is mostly a breeze. If you’re simply looking to connect to a VPN without changing any country or security settings, just click the app’s central button and let the tunneling begin. However, the app could make locating a server to connect to a little bit easier. It’s possible to sort CyberGhost’s servers based on speed, location, load and a number of other factors. But the controls for doing so aren’t highlighted within the app interface. At the time of this review, CyberGhost maintained 1,324 servers spread across 52 countries. While some VPN service providers might offer more servers in more locations, these numbers are entirely respectable and should support most tunneling needs. If you’re investing in a VPN so that you can engage in a bit of torrenting, CyberGhost will welcome you with open arms. The same goes for users who want to be be able to use streaming services like Netflix or Hulu while they’re out of the country or to access region locked content from elsewhere. This ability can, however, change at any time. Streaming content providers are very good at keeping one step ahead of anyone looking to use their services in unlicensed locations. CyberGhost allows subscribers to connect up to five devices at a time to their network and, in addition to macOS, offers apps for iOS, Android and Windows users. During testing, connecting to CyberGhost’s servers resulted in the following upload/download speed reductions versus connecting to the Internet without a VPN. Using CyberGhost on a month-to month basis will set you back $12 every 30 days. This might be fine for users with short-term needs, but it’s pretty expensive compared to the company’s one and two year plans. A one year subscription to CyberGhost can be had for $72, which breaks down to roughly six bucks per month. Signing on for two years is even cheaper, paid up front at $84. No matter which package you select, you can cancel your service within 30 days of purchase. Subscriptions can be purchased using a credit card, PayPal, or, if anonymity is important to you, Bitcoin. With fast VPN connections to US and Oceanic servers, and reasonable speeds to the rest of the world, CyberGhost could be a great VPN option—for most people. Users who deal in sensitive information may wish to look elsewhere for a VPN that offers a greater amount of privacy from government actors. CyberGhost's connection speeds make it a great VPN option for most people, but users who deal in sensitive information may wish to look elsewhere for greater privacy from government actors.